When it comes to desserts, fruit can be featured in infinite ways, as the main component, as a garnish, or made into a sauce to accompany a dessert. But there are certain desserts that are by definition fruit desserts—mainly compotes, cobblers, crisps, and betties, along with their respective variations. And there are several other types of sautéed and baked fruit dishes as well. Here's a breakdown of 7 of the most popular types of fruit desserts. 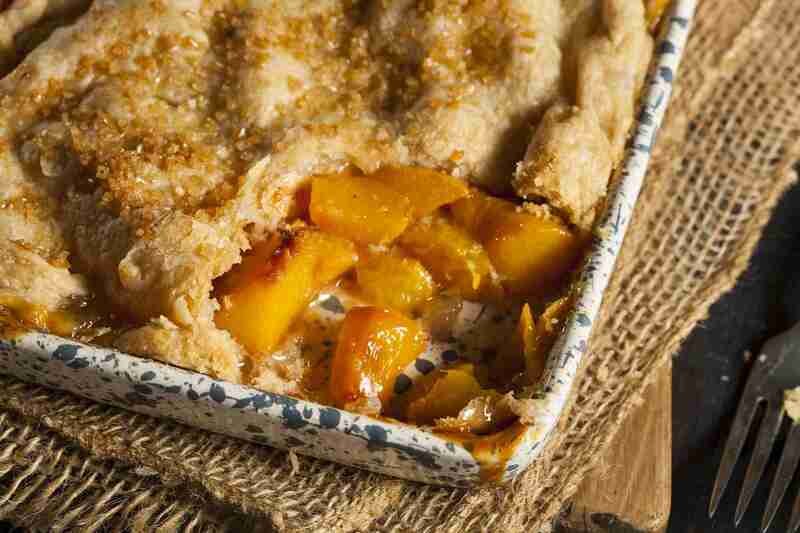 Cobblers and crisps are both baked fruit desserts, and they're often confused for each other. They are in fact quite similar, and because they're so easy to make, cobblers and crisps are two of the most popular homemade desserts. Even though the terms are often (albeit incorrectly) used interchangeably, there is a difference between the two. 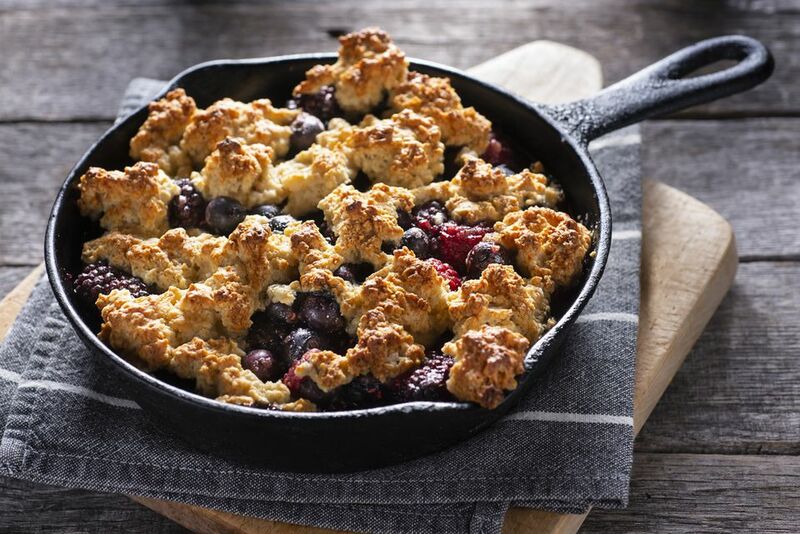 While crisps are baked fruit topped with streusel, fruit cobblers are instead topped with a single layer of pastry dough (i.e. pie dough). In other words, a fruit cobbler is essentially a fruit pie without a bottom crust. Which means it can be prepared with any fruit, fresh or canned, that you can use for making fruit pies, but apple, pear, peach and cherry are especially popular. Sometimes biscuit dough is used in place of pastry dough. Fruit compote is basically any sort of cooked fruit, specifically fruit that's been cut up into smaller pieces and then simmered or poached in some sort of flavorful liquid like wines, syrups, liqueurs, honey and so on. The most basic example are poached pears (although apples, pineapple, peaches and other stonefruit can also be used), poached (i.e. cooked at just below a simmer) in a simple syrup of water, sugar and vanilla extract. The fruit is cooked until just tender, then cooled in its liquid and refrigerated before serving. Apple crisp is certainly the most popular form of fruit crisp, but peach, cherry, and rhubarb are other common variations. This baked dessert is incredibly easy to make. After peeling and slicing the apples, toss with sugar and lemon juice, then spread in a baking pan, sprinkle with a simple streusel topping of cold butter, brown sugar, flour, and cinnamon, then baked until the topping is golden brown and crispy and the fruit is tender. Crumbles are variations on crisps. the main difference is the addition of oats to the streusel topping. Caramelized fruit is cooked in a sauté pan instead of poaching it. Generally, it's a matter of heating up butter and then adding the fruit along with additional sugar, and cooking over medium-high heat until the liquid, and the juices released from the fruit, reduce and turn brown and syrupy. It's served warm accompanied by a scoop of vanilla ice cream. It helps to slice the fruit lengthwise, or into longer pieces, to expose as much surface and thus maximize the caramelization. Pears, apples, peaches, pineapple, and bananas are wonderful fruits to prepare this way. Whereas crisps and cobblers are made up of a layer of fruit with either a streusel or pastry topping, with apple betty and its variations, we start constructing desserts made of alternating layers of fruit and pastry—or in this case crumbs. A traditional apple betty is made up of three alternating layers of sliced apples and cake crumbs. Keep this in mind if you ever bake a cake that comes out misshapen but otherwise tasty. Apple betty is a wonderful way to salvage a cake mistake. Some versions of apple betty use bread crumbs instead of cake crumbs, but obviously cake is more decadent. The apples are peeled and sliced, then tossed in lemon juice, sugar, salt, nutmeg and lemon zest, then layered with the cake crumbs, baked until the fruit is tender and finally topped with melted butter. Like their savory counterparts (i.e. potato gratin), fruit gratins are likewise prepared in shallow gratin dishes and browned on top before serving. But a fruit gratin consists of a layer of sponge or genoise cake topped with fruit, sometimes marinated in brandy or liqueur and sugar, and then topped with a layer of made up of a mixture of whipped cream, pastry cream and fruit brandy or liqueur. The fruit is sometimes marinated first in brandy or liqueur, in which case the liquid is mixed into the topping. Topped with butter, sliced almonds and confectioners' sugar, a fruit gratin is browned under the broiler before serving. Because the dish isn't actually baked but merely browned briefly, raspberries, strawberries, blackberries and cherries are good choices to use since they don't require much cooking to soften. Clafoutis (pronounced "kla-foo-TEE") is another baked dessert, almost like a pudding and traditionally made from black cherries mixed into a custard-like batter very similar to pancake batter, then baked in a shallow, round tart pan. Plums, prunes, blueberries or apples are sometimes substituted for the black cherries. A traditional clafoutis is made using black cherries that have not had their pits removed, since the pits add a significant amount of flavor to the dish when it's baked.